The company has a long and impressive history, having first been set up far back in 1898. Initially established as a boiler manufacturer, the company has held fast to this specialism, accumulating over a century of rich experience. CFB Boilers are renowned manufacturers of UK-manufactured vertical steam boilers, and are even an OEM partner of Bosch Boilers. With their purpose-built manufacturing facility in Essex, CFB Boilers deliver to clients from a number of different industries. The family-owned business offers a range of services including boiler design, quick and efficient installation, and maintenance and repair. With cost-effective prices, a quick order turnaround and first rate customer service, not to mention remarkably innovative products, it’s not hard to see why CFB Boilers are trusted by so many to deliver premier services every time. Their products can be found in an array of different industries, though CFB specialise in small craft breweries, university’s pharmaceuticals and the food sector. 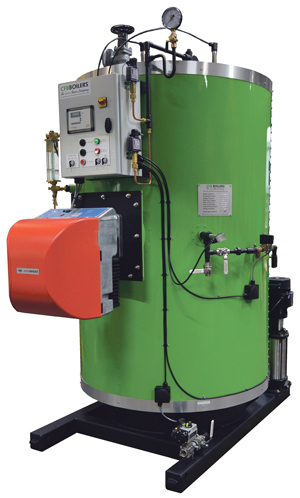 CFB Boilers have a variety of different steam boilers available such as the Series 4VT range, the Universal Series UL-S and more. 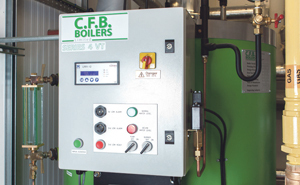 As well as being the UK’s longest standing steam expert, CFB Boilers are also the first and only steam service provider in the world to create a boiler unit that is not only energy-saving, but features a reverse osmosis feature that provides the same high performance expected of CFB Boilers at half the price. Named the BoilerRO, this unit features semi-permeable membranes with fine pores which catch 99% of inorganic ions and dissolved organic contaminants in the pressurised feedwater. Not only does this help the boiler run more efficiently, but it also minimises the frequency of boiler blowdowns and hence leads to significant energy savings. CFB have a wide availability of energy saving boiler options, such as the Series 4VT Steam Boiler 8. This class leading system features energy-saving four-pass technology and integral heat recovery. It also has a 30% larger steam chamber despite its compact design. The 4VT Steam Boiler has been praised for its energy efficiency and low running costs which leads to significant energy savings as well as cost savings. The four-pass technology allows for optimum heat transfer and guarantees low exit flue temperatures. In addition to being energy saving, the 4VT comes with a range of added benefits such as a 10-15 minute start up, easy installation, and smart structuring for easy cleaning and maintenance. On top of this, the tubeless construction of the machine leads to reduced metal stress and less need for descaling. CFB offer a great many turnkey solutions for steam, hot water and other such projects. Some of their current projects are with Sellafield Power Station, Cambridge University, Calor Gas and a number of various breweries, just to name a few. We asked Service Manager, Lucy Burton what we can expect of CFB in the future. She explained, “We are expanding our building by adding another floor to increase our training facilities and service administration offices. We have increased our services personnel and technical support by 4 additional people. “We have a dedicated service team who provide service and maintenance contracts which are tailored to the specific needs of every customer. Our contracts are popular with customers across a wide range of industries especially where the boiler is an integral part of everyday operation, providing peace of mind from a friendly and knowledgeable team. The company attends a number of trade shows, such as Beer X where they displayed their many wares and attracted new brewery clients and business. If you would like to find out how CFB Boilers can benefit your business, then be sure to get in contact today or visit the website for more information. This entry was posted in Featured and tagged Environment, Green, Manufacturing, Steam Boilers. Bookmark the permalink.